There’s an important disclaimer on this “quick and easy” flowchart to help you pick your character class in Dungeons & Dragons 5e. The disclaimer readers; “This ‘Guide’ not intended for actual use”. 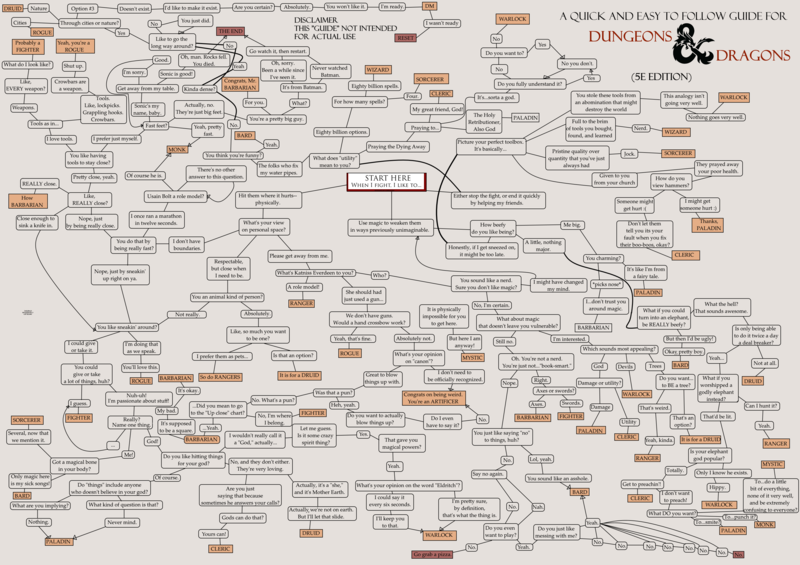 The crazy flowchart was shared by Redditor The Renegadem to the the Dungeons & Dragons sub-reddit where it has gone down well. At the time of writing, 92% of all votes for this chart have been up rather than a down of displeasure and as a result, the “handy” guide now has over 16,000 points of karma making it one of the most popular resources in the community. There are some unexpected outcomes in the flow of decisions including the recommendation that you should pick the Artificer character class because you’re weird. Following along the branches of the decision tree might have you become the DM, go out for a pizza or even die in under a pile of falling rocks.